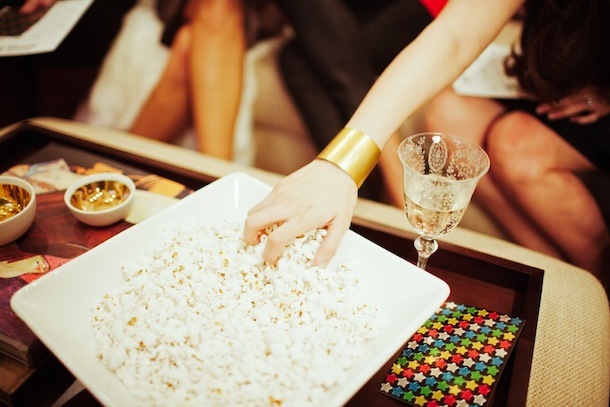 Party Planning :: Awards Season Bash! I’ll admit: I’m a bit of an awards season junkie. I read up on the nominations the minute they’re announced, make my guesses at who will win each category and pop open some champagne just in time to watch the red carpet entrances. The Golden Globes are on tonight (anyone else super excited that Tina Fey & Amy Poehler are hosting? ), and though I’ll be savoring every minute in my PJ’s, I’ve always thought it would be really fun to host an awards show dinner party and invite all my film-loving friends. 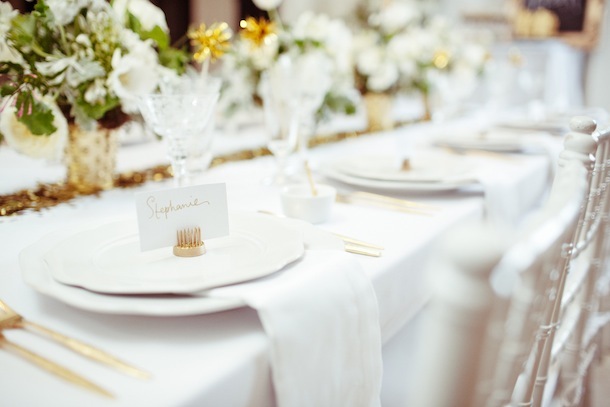 Of course I loved the chance to team up with HGTV to create this Oscar Night Party inspiration shoot brimming with golden glitter, delicious hors d’oeuvres and a little Academy Awards trivia to kick things off. By the way, you’ve still got 6 weeks to plan for this year’s Oscars on February 24th! Keep reading for a few of the glitzy-glam outtakes by Chad Wadsworth, and hope you get inspired to throw a little bash of your own! 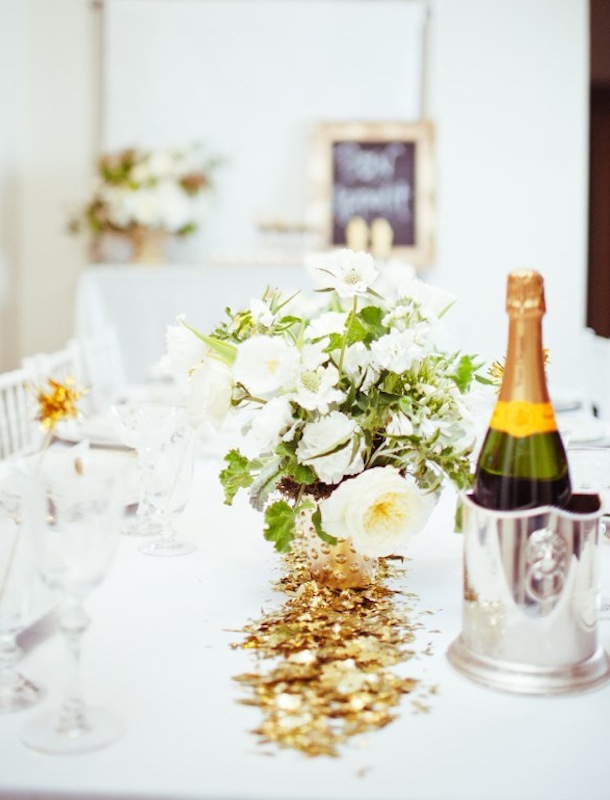 See this post for instructions on creating the gold confetti runner… you won’t believe how easy it was. 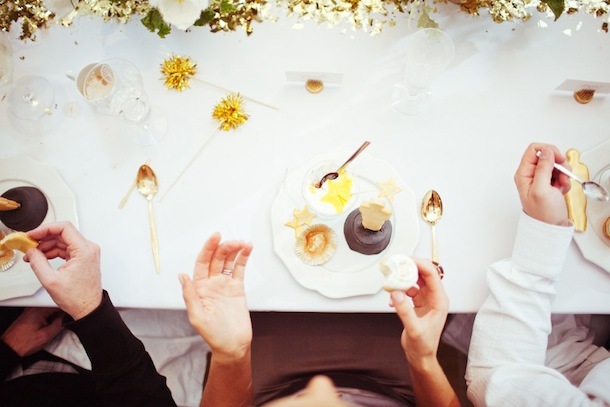 We crafted these gold place card holders out of inexpensive floral frogs. Get the full DIY here. The stunning flowers are by The Byrd Collective. 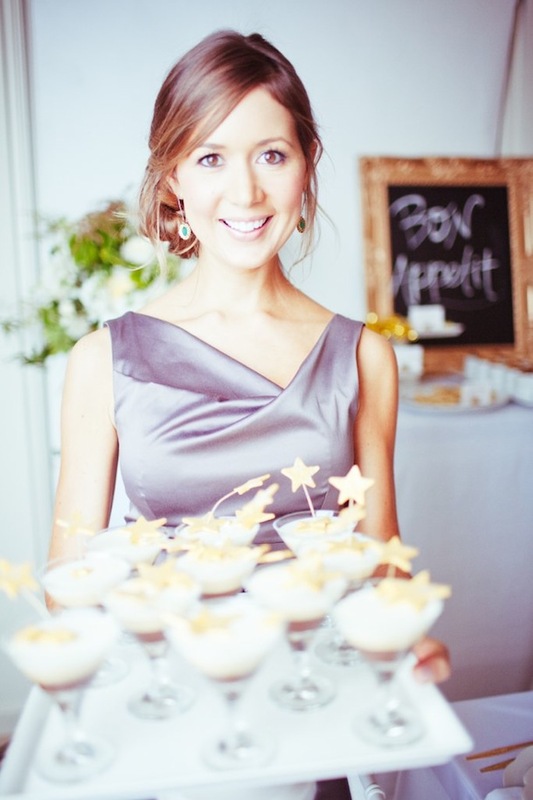 Word of Mouth created the mouthwatering confections at this party, including these gorgeous parfaits garnished with glittering shortbread stars. Love this post! 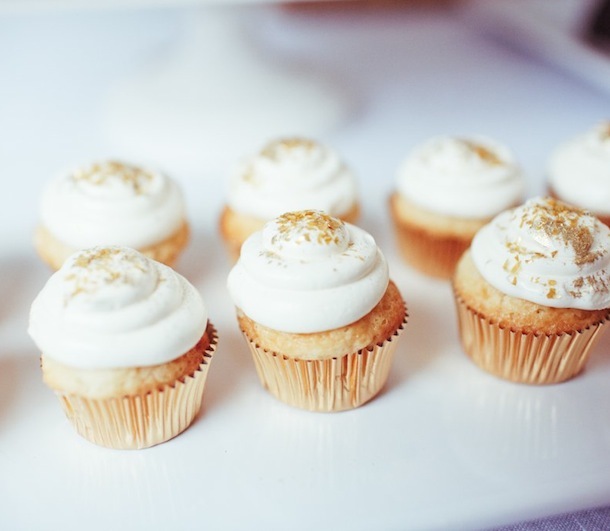 Those glitter cupcakes stole the show here and you look beautiful! Love your hair and those fab earrings! 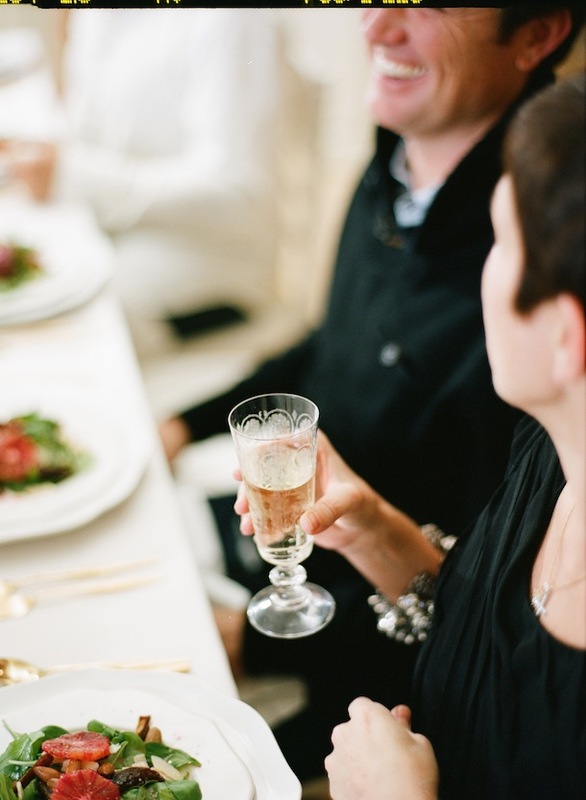 This is a great idea to do for any celebration! I’m a cupcake girl so I will be trying a little glitter next time I bake some! XO Have a great Sunday! Love the idea. Every year one of my friends whose husband is in the movie biz ( a documentary film producer) throws a beautiful sit down formal dinner party on Oscar night. They normally invite about 8 couples and make it a different theme every year. She goes all out and its always a night to remember……I also want to have one one year! 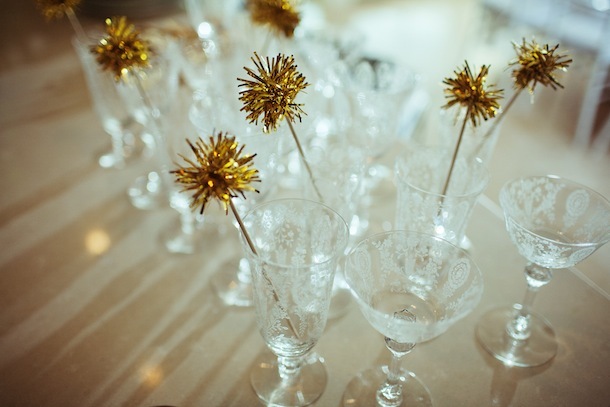 That sounds amazing… I’m jealous that I’ve never been invited to such a fab Oscar night bash! 😉 Hope this year’s is a blast! I’m going with Lincoln and Les Mis for winning in their Best Picture categories…although maybe Argo could nudge out Lincoln. Les Mis is the one I’m really supporting as it’s the only one I’ve managed to see. Aaah, I haven’t managed to see Les Mis, and I’m dying too! I’ve heard nothing but fantastic things about it… and Anne Hathaway is one of my faves. It would be fun to foster a little friendly competition by having guests fill out their votes for the major categories, and then award a prize to the winner — maybe a couple of movie passes? Thanks so much! Yes – having everyone cast their votes is such a fun activity to throw in the mix. And movie passes would make the perfect prizes! Such a fun and festive way to celebrate Hollywood’s biggest night!! Love!